Being a Brighton based station I reckons this is a wee bit of tribute, but we had none other than Jay Pace on the showcase selection. I caught some of his set at Glade 2006 and we’ve pushed his forthcoming releases and the frankly excellent Jengamaster on show before so it’s only fitting we got him in for a showcase. 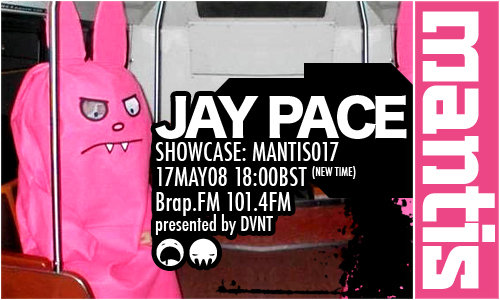 Jay fell into techno in the mid nineties, having found his way into dance music through the London rave scene. Together with like-minded people he helped build up a soundsystem, and then establish a regular night, namely: Black Box, which is in its third year down in sunny Brighton. Taking influences from rave, old school techno, and dipping into a host of different sub-genres Jay experiments with different styles to deliver a personal take on a decade of dance music. Now based in Buenos Aires, Jay is focusing on his production, with a release currently out on r3tox and two forthcoming releases on Tyrisia later this year. Jay’s showcase went down very well with our live listeners. A truly solid techno mix with some meaty surprises. Can see that mix being on rotation in our studios for a while to come. In the first hour you had DVNT behind the controls and we had served up some tasty forthcoming pieces from Si Begg and iLS (sick remix there) as well as 2 tracks from the new 4 track EP on Subgrade Records, with Kodek. As well as some dubstep heavy weights.